The tents did their own version of hula in the wind, like animated parachutes tethered to the ground. Great weekend, thank you all! I know how much fun I had by the amount of sand that fell out of my clothes. Hawaiian Monk seals are solitary creatures and very rare. They visit Molokai's remote beaches and shy away from people. 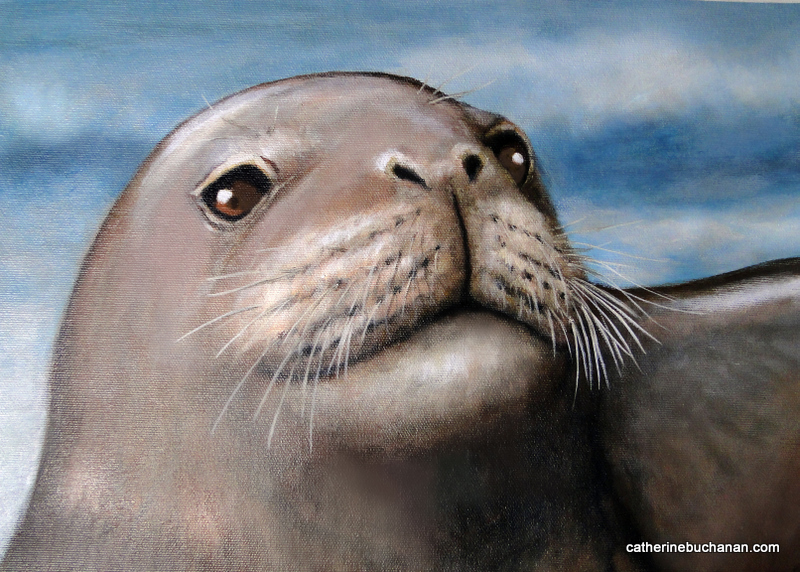 This old guy was huge, his face was green with algae growing in his fur, but I left that out. Since I went camping with friends over the weekend I started the painting outside, but wasps dive bombed the paint. One was fine, but it left and soon returned with a small swarm. When they made it quite clear it was now their paint I took the hint and finished in the tent. 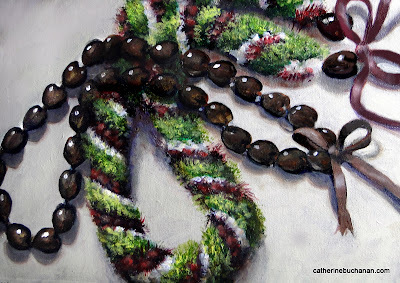 I'll finish a painting today for the 90 day project, but won’t have internet access to post it this evening so there will be two posted on Sunday. 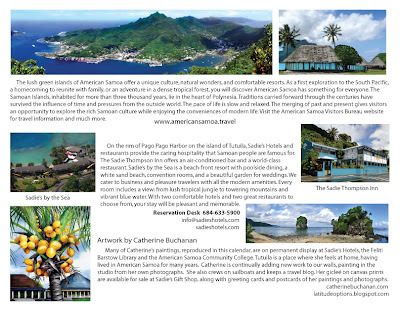 Sadie's Hotels in American Samoa produced a 2012 calendar using images of my paintings that is available for sale at the Sadie’s Gift Shop, several stores in American Samoa and by mail order. Calendars are 8.5 x 11"
$8.95 each with priority mail cost of $4.95 which covers any quantity! Re-sellers please send an e-mail for a wholesale price list. Pay via PAYPAL to: sales@sadieshotels.com VISA, MC or AMEX are also accepted. The paintings in the calendar are of my friends and neighbors, the stunning scenery and flowers growing outside my door in American Samoa. I used to own a thrift store in Nu’uuli and lived alone for many years on the side of a mountain in a quiet village surrounded by beautiful gardens. 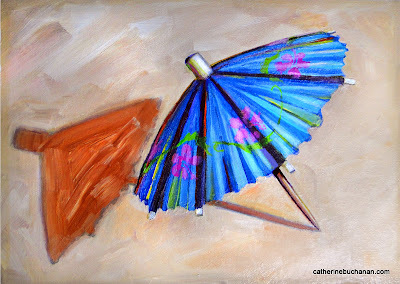 To keep the store going I often returned from traveling with my suitcase stuffed to capacity with tubes of paint and last minute items I found at yard sales. On one return trip my ongoing flight was cancelled so I checked into a hostel in Honolulu. I was given the last bed left in a room filled with drunken teenagers. When I swung my overloaded old suitcase onto the bunk it unfortunately burst open. Cake pans, talking Teletubbies, art supplies, size 14 loafers, a dozen Barbie dolls, 6X bras, men's underpants and handfuls of Happy Meal toys flew across the floor. I didn't have my own clothes with me, just the random stuff now laid out at the feet of some flabbergasted guys from Wisconsin on a bender in the islands. Their empty beer cans and ant covered pizza boxes didn't look quite so trashy anymore. We stared at each other in mute silence until the cake pans stopped rolling around. I felt like I just blurted out my most bizarre dream during a job interview. One guy recovered a little faster than the others offering, "Cool, can I buy you a beer?" Being peculiar was apparently an effective ice breaker with inebriated Midwestern teenagers. I've never intentionally repeated the technique, although in every culture there are ways to achieve similar results. 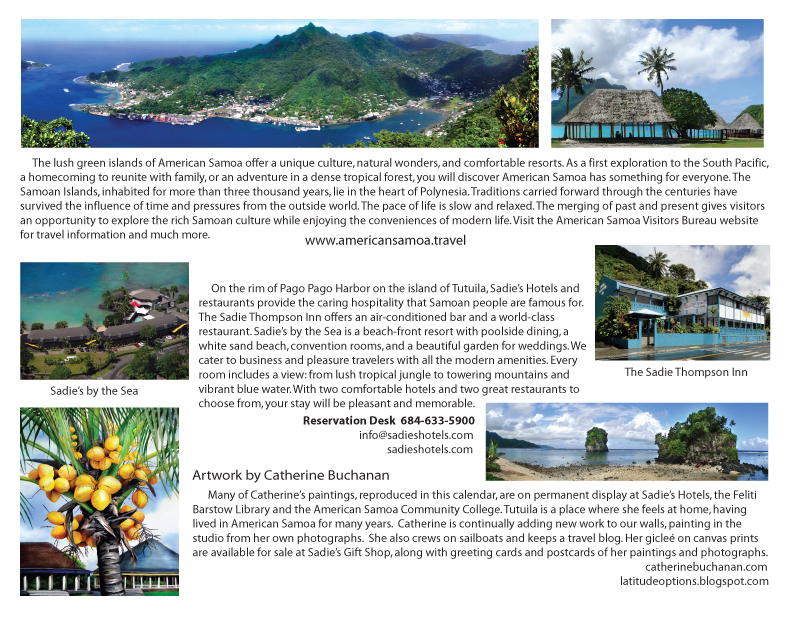 Giving food in American Samoa is always appreciated, but it’s not cool to make a big deal about it. I never could pronounce the name of the village I lived in. Tafeta seems so easy, but there are stresses on the vowels I could never hear or repeat, but I would try at least five different ways before people laughed and gave up on me. My Mom never minded embarrassing herself, although she used to make me want to run and hide when I was a teenager and my sister refuses to be embarrassed, which is an asset while traveling, because it’s going to happen. 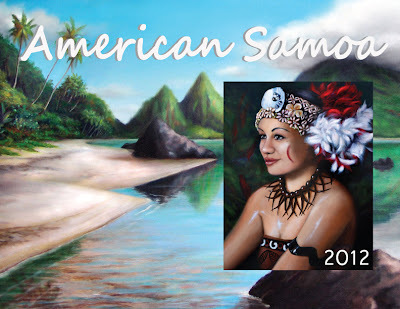 I might have been amusing to my neighbors in American Samoa, like I was for the guys in the hostel, but I was warmly tolerated, often included and loved living there. These paintings were done in that spirit. Many of the originals are on display at Sadie's by the Sea. Reproductions on canvas are available from any of the paintings, produced by printthatimage.com, an exceptional fine art printer. Please write to me if you are interested at cb2c@yahoo.com. Soap has got to be mankind’s finest social invention. 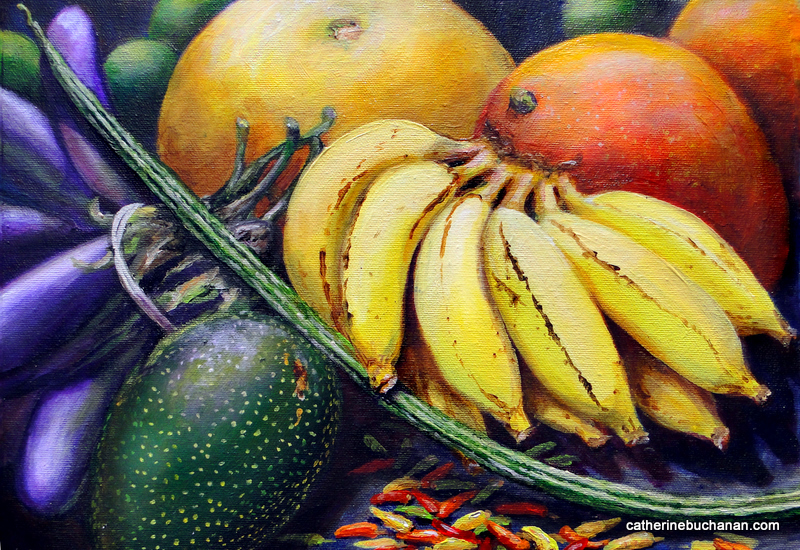 Life in the tropics would not be the same without it. Living on Molokai would be impossible. In a matter of weeks everyone on the island would be the exact same color as red dirt. I washed the dogs today, the water swirling down the drain was oxide red and they live indoors. Some would argue that coat hangers are up there with soap, or we would all be buried in garments, but soap makes social interaction so much more pleasant. On my list of things to appreciate I’m surprised it didn’t come up sooner. The puppy that runs around out of control in this house chews on volcanic rocks, but won’t eat milk bones and he bit into a bar of soap when I dropped it. I couldn’t stop him fast enough, but I’ll smile every time his surprised little face comes to mind. Gotta love soap. Finding produce on Molokai isn't always a matter of going to the store, it gets better. Coconuts are available on the side of the road. The Saturday Market features fruit and vegetables grown in back yards and a trip to Kumu Farms near the airport yields fresh picked greens and more. The farm is surprising. 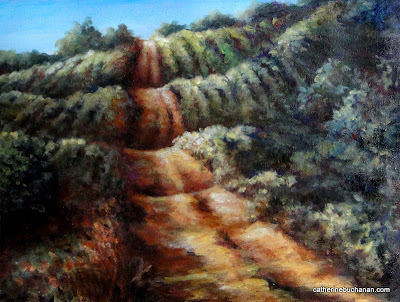 Variegated rows of leafy plants in every shade of green against the red volcanic soil vanish toward the horizon. 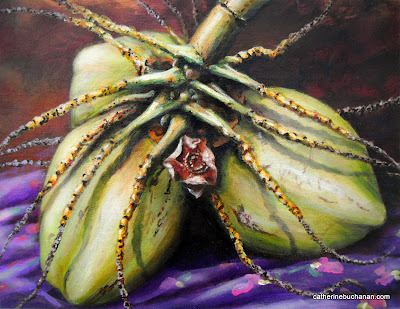 Papayas hang from trees by the thousands. Vegetables are laid out on tables, stacked in baskets or in the case of giant pumpkins, heaped on a pallet. 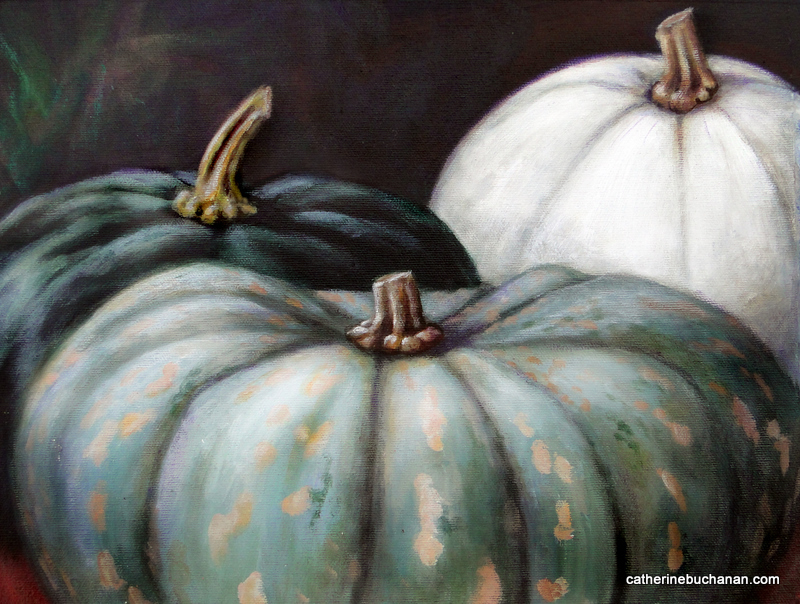 Three odd pumpkins sat on a picnic table, glowing in the soft filtered light of a large banyan tree looking more like sculpture than food. I went to get one thing and left with a sack full. People clutched bags of lettuce like addicts. Manu showed me around, extending an invitation to paint, photograph the farm or just wander around. I could easily sit and stare at vegetables all day, but then I might have to explain myself. Happy pre-Halloween. 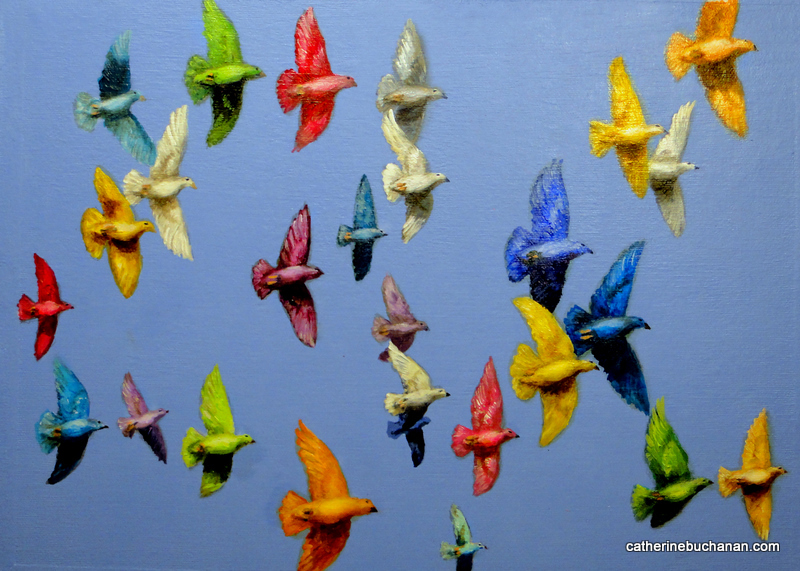 The first time I saw these colorful birds I swerved the car. They are for real, with a little help from their owners and some harmless food dye. They stick together and come back where they are regularly fed so it's not a stretch to release them at events and expect them to return home. The birds don't seem to notice that they're more colorful than Gummi bears. When released they circle a few times to orient themselves in the direction of the roost before heading off to inspire first time witnesses to swerve. 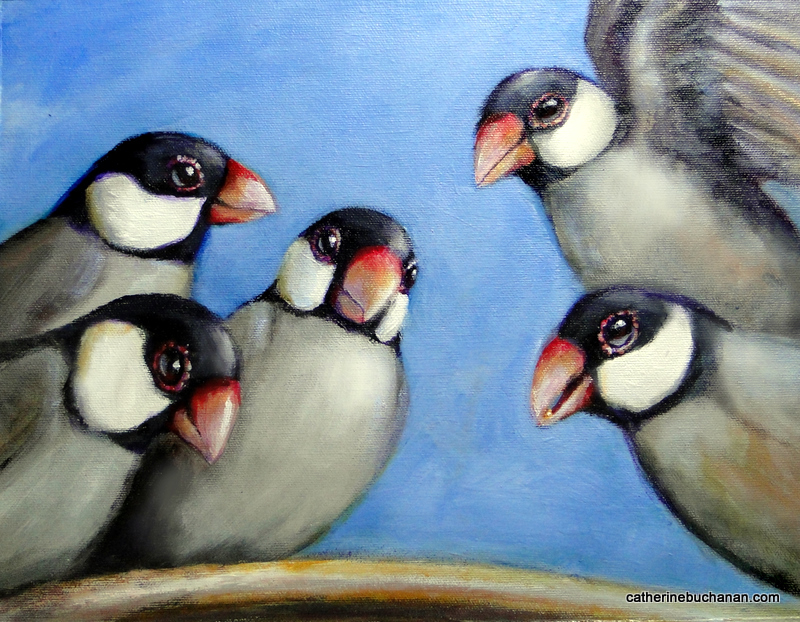 The flock numbers around one hundred and fifty, certainly more than the scope of this painting, but the entire spectrum of birds against Molokai's cobalt blue sky is nearly enough to cure manic depression. Thanks Bill, I love the image, but if you call me Cathy I'll start calling you Uncle :). 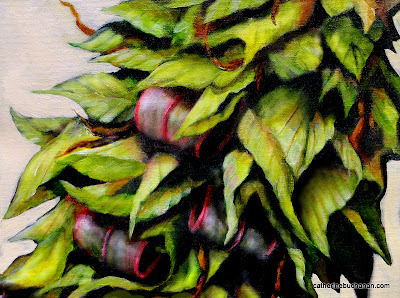 Inspired by Barbara Jackson's pomegranate painting, paintingwithpencil.blogspot.com. I agree with you that there probably isn't any more merit in painting faster, but it is an exercise in loosening up. Also, when I slow down and concentrate after rushing through a few they come out better somehow. 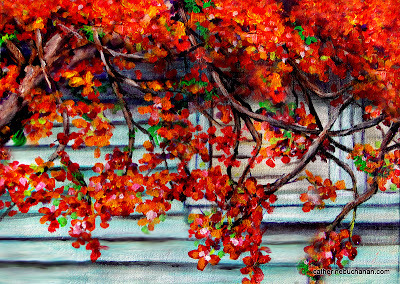 There is always more to learn with painting, which is probably why it never gets boring. These small flowers wilt shortly after they're picked so I sat outside in the wind next to the plant and developed all new respect for plein air painters. Dirt blew into the paint and the brisk wind kept the subject in motion. Flies and mosquitoes annoyed the crap out of me, then some weird winged thing drowned in the white paint. 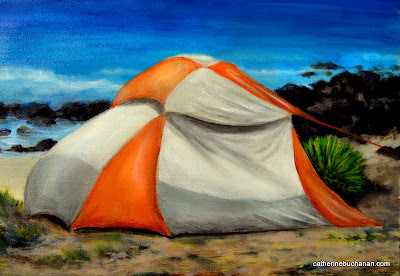 I had planned to paint landscapes as part of this project, but I may end up painting inside a tent to avoid watching bugs die horribly in the paint. 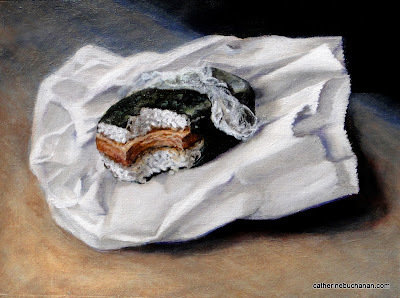 After reading Barbara's blog I intended to paint faster today to see what would happen, but the true motivation to race through the painting came from wind and bugs. Friends came over so we practiced drawing party/drink umbrellas. Thanks Sherry and Noel, you made my day. 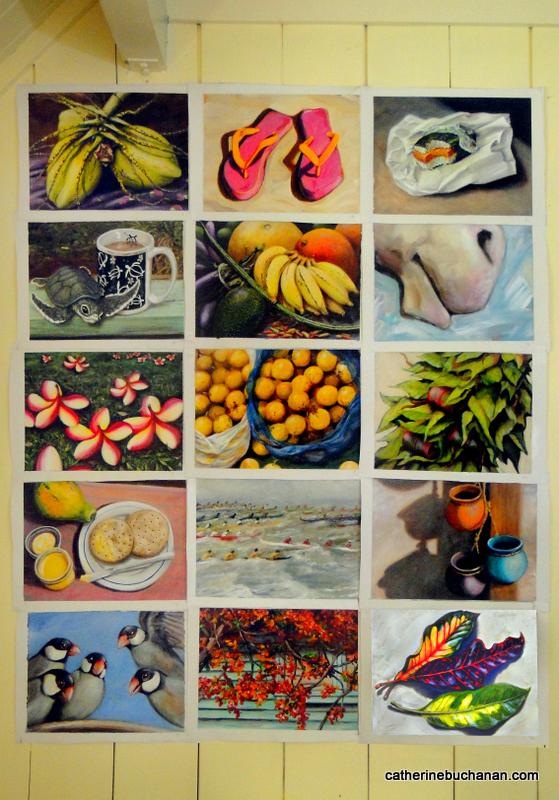 Painting is usually a solitary endeavor so it was fun to have company. You're welcome anytime! Back in the 70's puka shells were actually cool, briefly, before acquiring icon status verging on tacky like golf pants and patchouli oil. 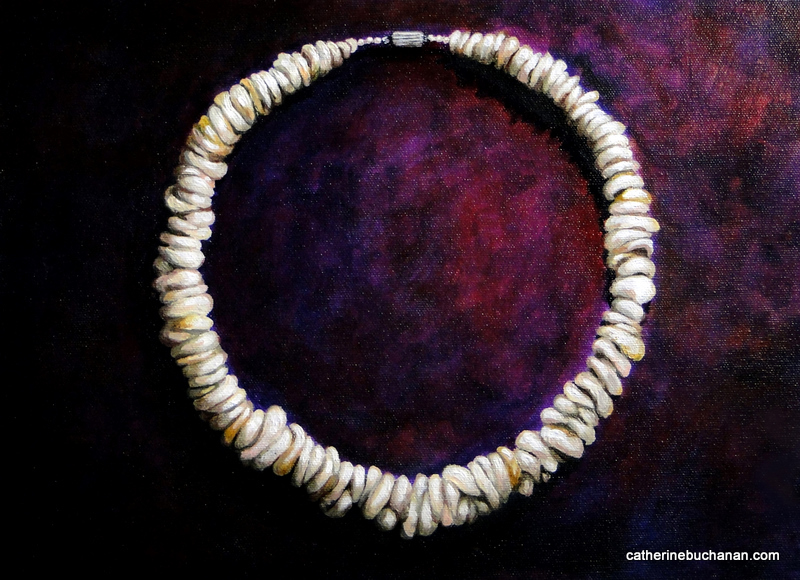 This necklace was made by a friend who finds the shells on a remote beach on Molokai. Some days only a few turn up, other times there are heaps. I've looked and never found any, but then I would need a chiropractor on retainer to stoop all day picking up shells. On Molokai puka shells are mismatched, varied in color and quite unusual, but together somehow they work. Pretty much like people, which is cool. Now say Papohaku puka three times fast. Molokai's red dirt roads crisscross the island. They wander into the back country, wind downhill to the best beaches and go nearly vertical up the mountain to the rain forest. Bumping down a dirt road in an old pick-up, music blaring, dogs barking in back, those are the best times on Molokai. The movie theater closed and there are only a handful of restaurants on the island so most days entertainment is pretty much watching coconuts fall. But there are so many places of exceptional beauty and rare moments of quiet, well, if you turn the radio off and leave the dogs home, but who would do that? 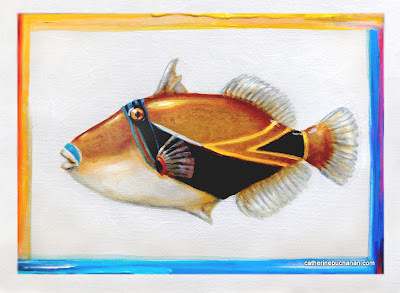 This is the Hawaii State fish, but it does take a little practice to say it. I've heard the name means "one who grunts like a pig" and sure enough they do. I caught one and it is surprising how loud they are, but it's not exactly grunting. One who croaks like a pig is more like it. I threw it back, because I couldn't imagine eating a fish that is so entertaining. It's not hard to say if you break it down, humu humu nuku nuku apu ah ah, just grunt it out. I was telling my friend Chris, an amazing fine art printer (printthatimage.com), about other web sites that feature artists who paint every day. One artist claims to be the founder of the painting every day movement, although it isn't an original idea. Picasso for one did similar exercises with lithographs and it's well worth doing, I guarantee you'll find out where your strengths and weaknesses are. The exciting thing about painting is that there is always more to learn. 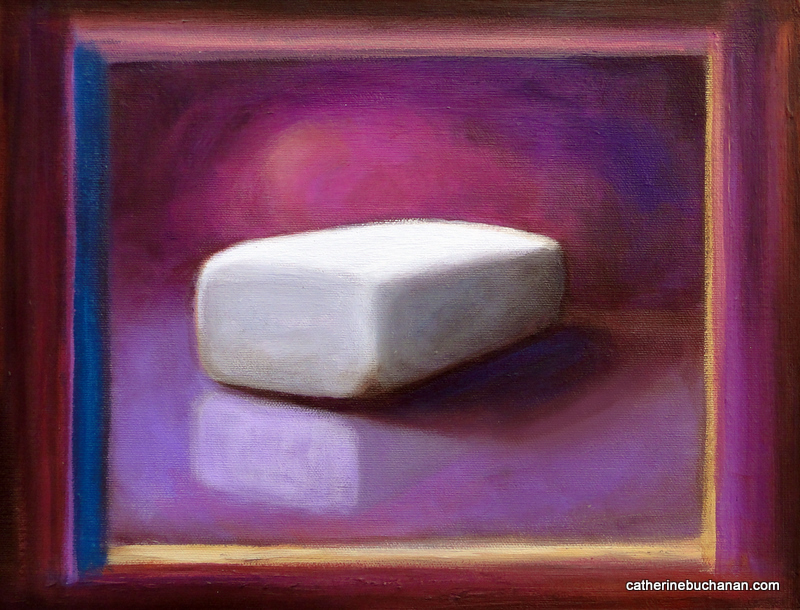 The paintings don't always come out like I imagine, at some point they take on a life of their own. 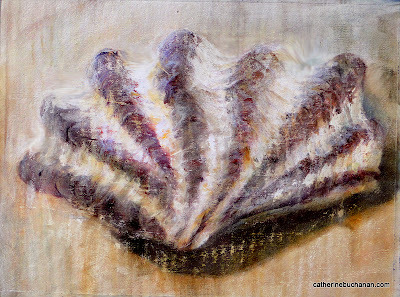 While I was thinking about cave painters, because they may well have painted every day too, this shell happened. Being given a lei is always special. 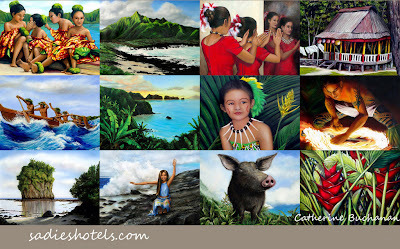 Volumes can be written about the nuances of lei giving in Hawaii, it is that much a part of the culture. They are significant and elegant, friendship made visible and always worth keeping. The first time my sister visited Hawaii she collected handfuls of these wacky leaves and did a watercolor painting. I barely noticed them. It's like Canadians getting excited about geraniums, a plant nearly invisible to Californians. 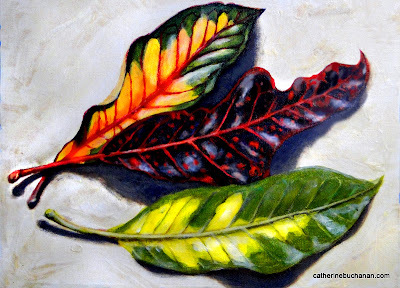 This morning my sister suggested I paint Croton leaves. I went to search the yard, not sure if there were any. They line the walkway to the house and I go by them everyday, only it took a Canadian in California to point them out. Thanks Mernie. 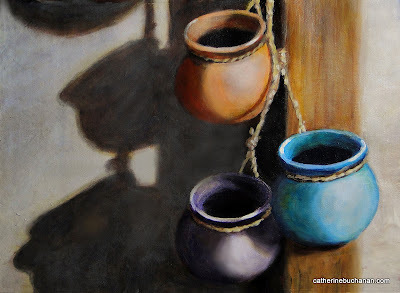 A string of clay pots hang in the potting shed at my friend's house where I paint. I spent many months in Mexico this year and miss friends and certainly the food. Every time I glance at the pots fond memories of Mexico come to mind. Now I get why people collect souvenirs. It took awhile before I put two and two together though. If there were a place on Molokai to get good tacos I would have been rushing to town like Pavlov's dog. Today my friends rode in the Aloha Week Parade in Kaunakakai, Molokai. 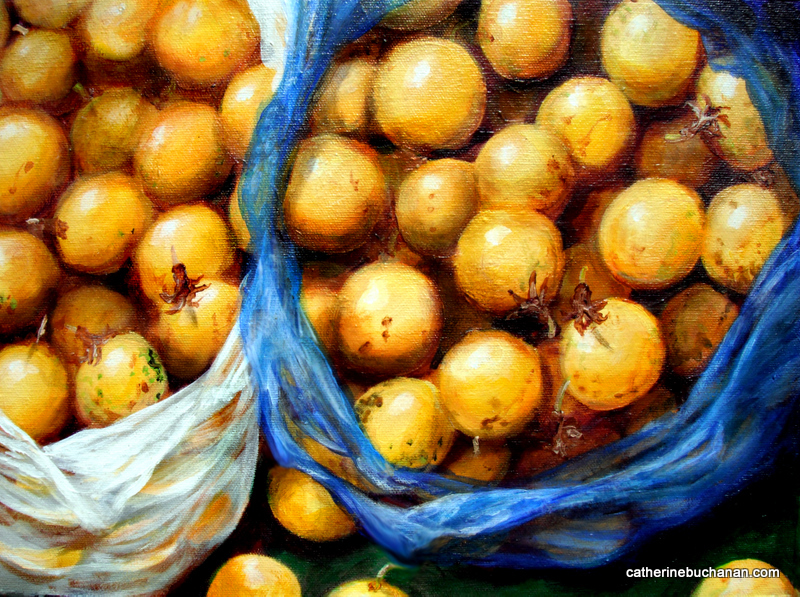 I would like to paint portraits of all of them, but to finish the painting in a day I had to choose one small detail. 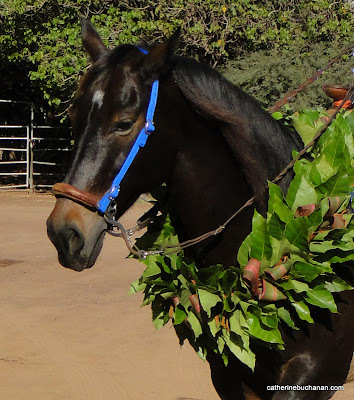 Making leis for horses is a skill few people possess. Auntie Tika tied kukui and ti onto rolled burlap sacks with string, rolling the leaves as she went. The mountain of greenery gathered for the leis had to be moved in a horse trailer. The animals know they are dressed up and act like the parade is all for them. They paw their feet, bow their heads and mug for the camera. Nothing like a beautiful family riding unabashed horses to make the parade special. 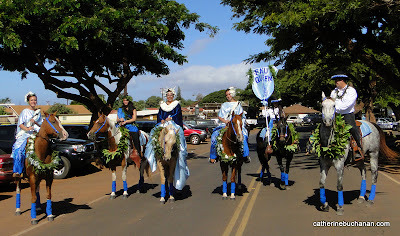 Kulia Keli'iku-Peters, 2011 Pa'u Queen and her family. Horse leis are carefully made with non-toxic plants since some horses try to eat them. There are four tedious, painstakingly accurate versions underneath this painting that really did need to be covered up. When I quickly slapped paint over yet another failed attempt I finally liked it. Imagine my surprise. Personally I think the best Spam musubi on Molokai is sold at the gas station. They keep it hot in a little oven. While Spam and rice wrapped in seaweed isn't for everyone (right, like Spam is), I guarantee that if you spend enough time in Hawaii you'll not only get over your initial disbelief, but will eventually learn to love it. One day you too will find yourself in line at the gas station just because you got hooked on hot Spam and seaweed for breakfast. Yum. 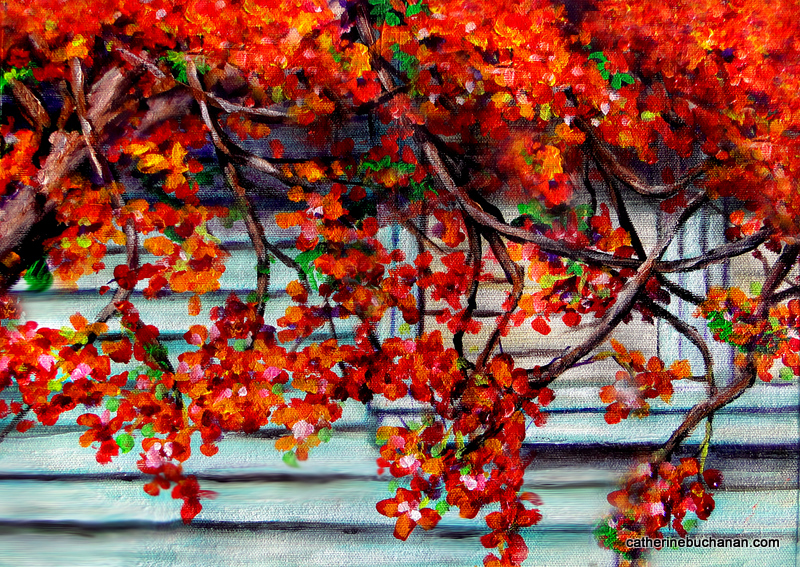 This time of year Flame trees light up the landscape. There is almost no paint bright enough to duplicate the color. Standing under a huge canopy of blossoms on a carpet of petals is one of those unexpected moments in nature that take your breath away. The trees can be enormous, on a windy day in full bloom they actually look like they are going up in flames. Introduced in the late 1800's the sparrows have thrived in Hawaii, although they are becoming rare in Indonesia where they originated. They are given large bowls of seed twice a day where I'm staying, lining up on the wires that cross the yard half an hour before like music notes. Their insistent chirping now a familiar song marking the time twice daily as they are never, ever late. I can't even do that when I wear a watch. The outriggers headed out to sea early. It was exciting to witness the culmination of years of training, cooperation and effort behind the scenes to bring the race together. 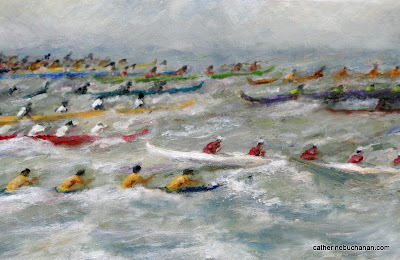 More than a thousand canoe paddlers along with their friends and family stood silently on the beach before the boats left, head's lowered in prayer for a safe passage. 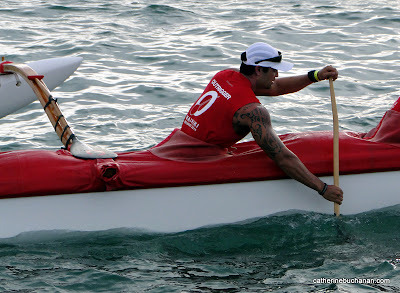 The race crosses 41 miles of open ocean from Molokai to Oahu. I painted the scene in a style I find difficult hoping to express the energy of the moment. 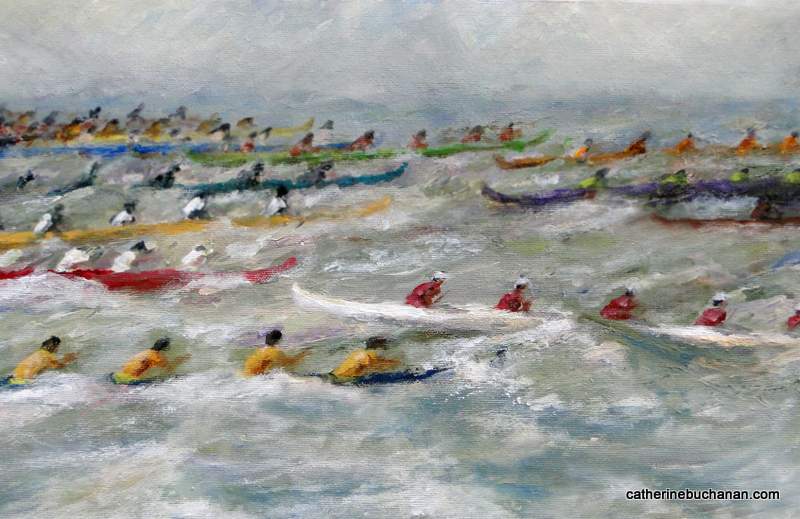 The rolling waves and all those bodies in motion called for something beyond hard lines. I may revisit this one after the 90 day project is over and try again, it's not quite where I want it and don't know how to make it work, yet, there is always hope. 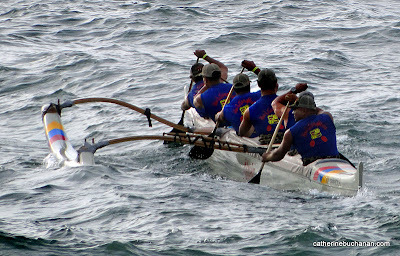 This morning 160, 6-man canoes left Molokai with crews from all over the world. My friend Julie picked me up at dawn to see the race start. On the way back she asked if I wanted a few bags of lilikoi that she picks up in her yard. So that's what made the car smell so good. Thanks Julie, that stuff is like gold. Tomorrow I'll walk up the street and ask Auntie Ada how to make lilikoi butter. It only took four hours to paint them and two hours to cut them open and extract the juice from the gooey stuff inside. I have no idea how much I need, although I saved the seeds. There's enough to grow about 50,000 more. Each day I find something to appreciate that will also be challenging to paint. After the basics are organized I take a minute to clear my mind and ask for help. My first thought usually lacks confidence so I set it aside, then I get this inkling that maybe there is a universal source of inspiration or a brilliant muse ready to come out of hiding and I get a mental picture of cheesecake, or a smoldering cigarette or something else that I really want that has nothing to do with painting. So I give up thinking and just start. I keep going back to what every successful person who has pursued any creative venture says, you just have to keep doing it. There have been a few times when the brush did something unexpected. A few times I completely lost track of time and hours passed that seemed like minutes, although the first half hour really feels like a marathon. 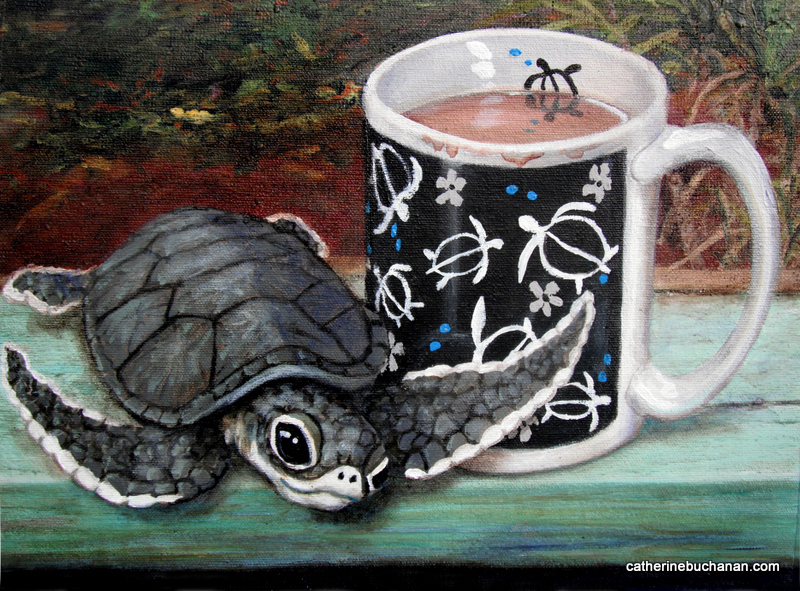 All those worthless thoughts that slow things down were not as frequent toward the end of the week and that is progress. I don't get why egos get in the way. You'd think egos everywhere would leap around with day-glow pom poms shrieking raucous cheers to support damned near anything that would make them feel better. I'm giving mine a whistle and a marching band, just for not giving up. Great produce on Molokai is found on the sidewalk in Kaunakakai on Saturday morning. Most of it is grown in back yards. Vendors set up tables to sell everything from red hot peppers to hand made baby blankets. Proportionally this pile of loot looks strange. Apple bananas are small, the grapefruit was enormous and tropical chili peppers are extra tiny, but should never be underestimated. In a recipe that calls for them you could substitute mace. In Samoa people plant the bushes outside their windows to discourage thieves and it works. I'm not sure what the long "bean" is. It tastes bitter raw and I'm not sure how to cook it, but I'll enjoy looking at it on the counter. 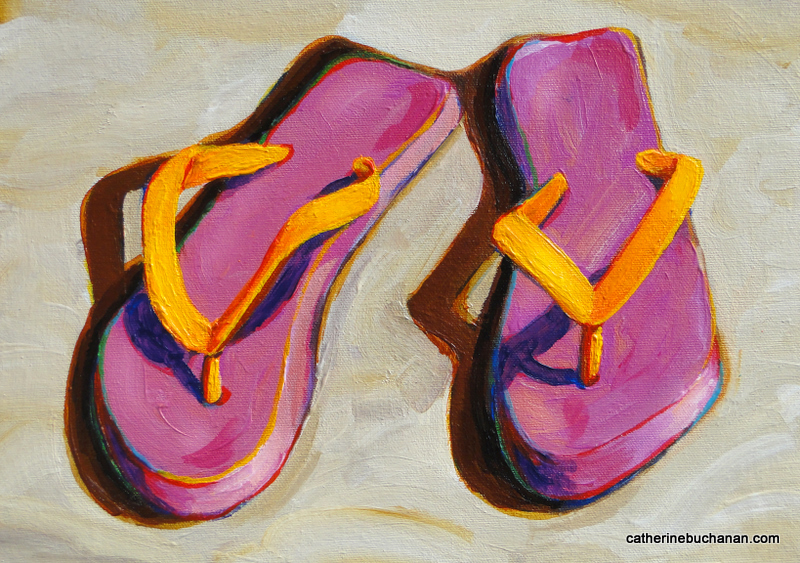 Flip-flops (or slippahs in Hawaii) and maybe a pair of sneakers are all anyone needs on Molokai. Most people kick their shoes off outside the front door and a good party is a massive pile of slippahs on the porch. Like luggage, they tend to look alike and I walked off with my host's a few times on my last visit. This time I brought unmistakeable pink and orange slippahs. The beauty of this great weather is that the dog will probably chew them up long before I need them. Lilikoi butter is canned in small jars and handed out to friends. The dear Aunties of Molokai make it from a variety of passion fruit locally called lilikoi and nothing like it is found in stores. If it came in bigger jars I would drink it. The crackers are saloon pilots, made in Hawaii, but the package also claims "Original Hawaiian". I'm not totally up on the history of crackers, but I think these are quite similar to the hardtack the ancient mariner gnawed on. It's a sturdy, long lived cracker. I found a 5 gallon pail of them recently that had been stored for 10, maybe 20 years and they were just fine. 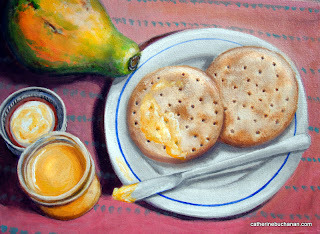 So, the most exquisite, rare jam in the world on a nearly extinct cracker with a papaya, great breakfast. When plumeria flowers fall off the tree they pinwheel to the ground, landing face down. Often the back is brighter than the front. It's one of the few random things in nature that looks incredibly well planned. 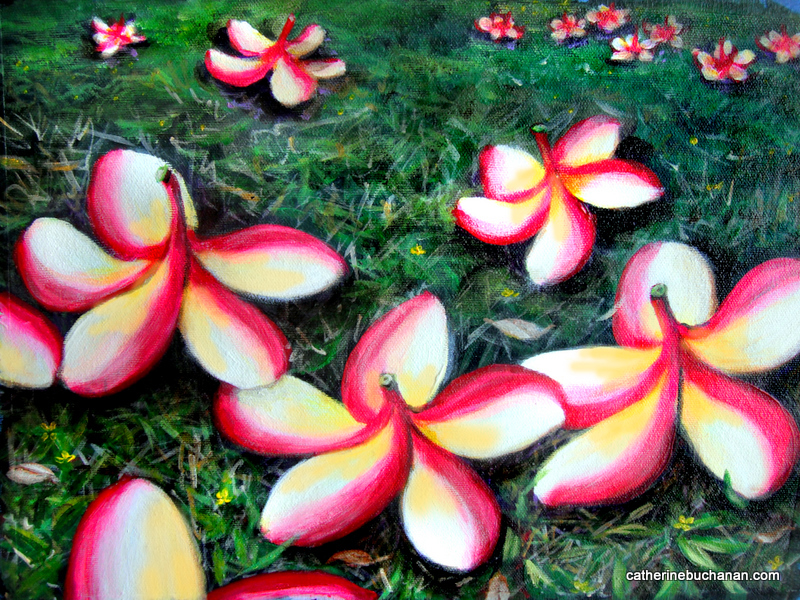 Flowers are never as amazing painted as they are in real life and plumeria smell heavenly. 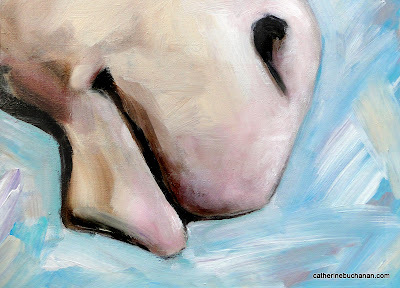 I told Dottie this morning it should be a scratch and sniff painting. 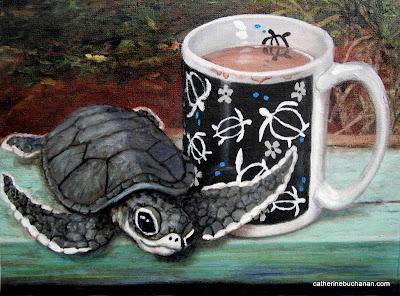 The baby sea turtle is from the Honolulu Zoo gift store, no live baby turtles were injured or even marginally inconvenienced during the making of this painting. Plastic babies actually sit still. I'll wait a few weeks before I try painting the puppy in residence, one day when I feel like running aimlessly all over the house. On a boat on the ocean there is plenty of time for existential angst, but none comes up. Daily activities seem meaningful and the destination is usually known. 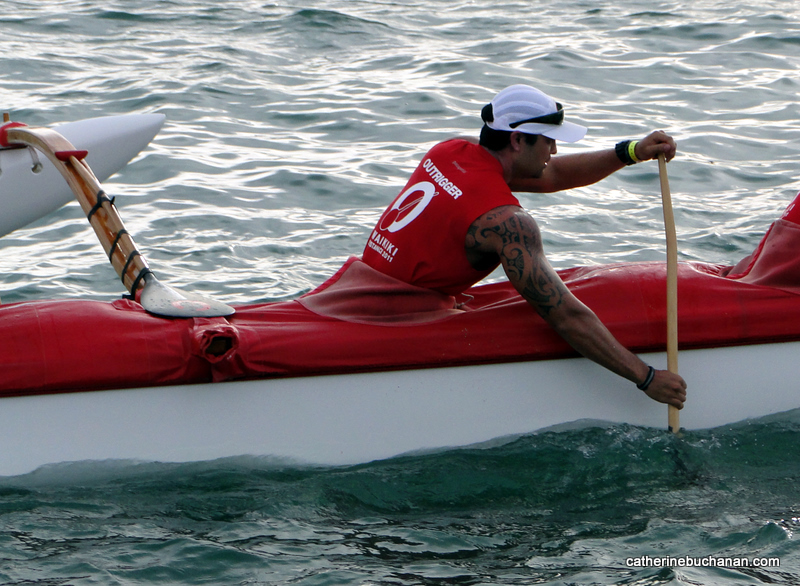 The boat wouldn't go anywhere without the crew and that small sense of purpose rids the day of self-doubt. Out of sight of land I feel joyful, even though I'm not a naturally cheerful person. 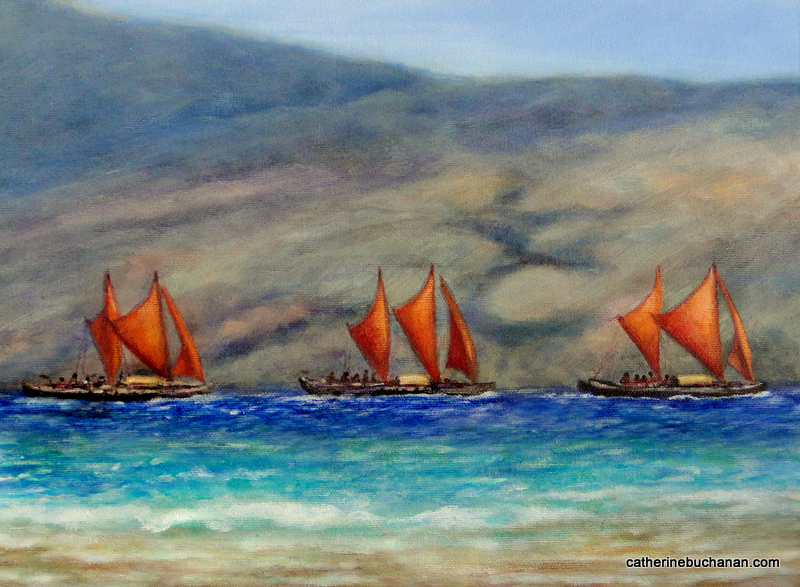 Now I'm back on Molokai, where I find it incredibly difficult to manufacture a sense of purpose. I'm certainly lucky to be living in a beautiful place surrounded by good friends, but those moments of peace, so abundant on a gently rolling sea are less frequent. It is a contradiction difficult to reconcile and just to say, there isn't anything wrong with Molokai. Boats of all places should feel claustrophobic, I must have something backwards. 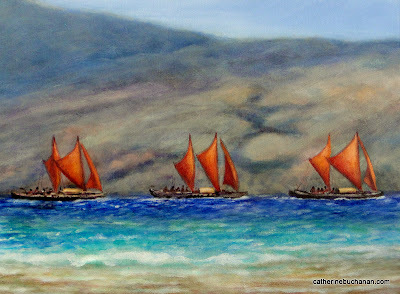 My last project on Molokai I worked long hours, didn't get out much and gained 35 lbs. 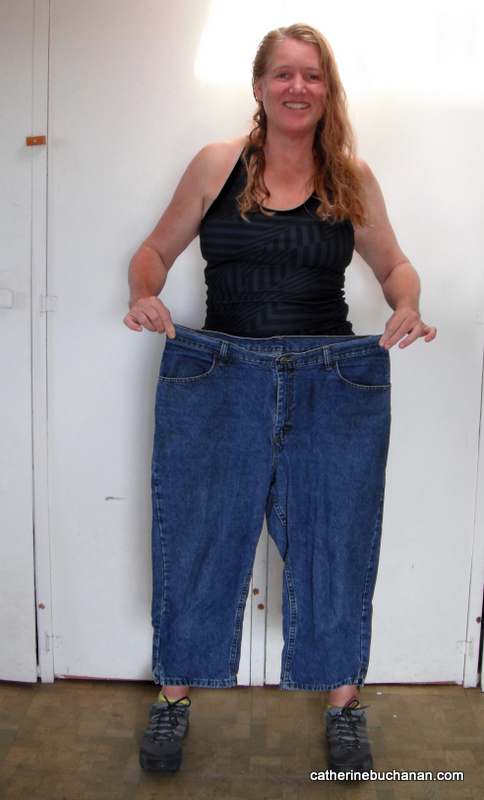 I unpacked clothes I had left behind and found a pair of pants that fit seven months ago. I want to paint to more spontaneously, so I stand up to work as sitting makes it too easy to goof off, forming new habits requires focused daily practice. I've invited the painting muses to visit as I've come to believe that I'm the vehicle, not necessarily the driver when it comes to creativity. I've had this experience many times, like that moment in Google Earth when you zoom in to street level and the view point magically shifts, ideas arrive like that, from some other dimension and they feel like a gift. I don't know if I'm capable of attracting enlightened muses and not, for instance, some disgruntled spirit whose last project was The Creature from the Black Lagoon, but that might be okay too. I'm willing to be surprised. 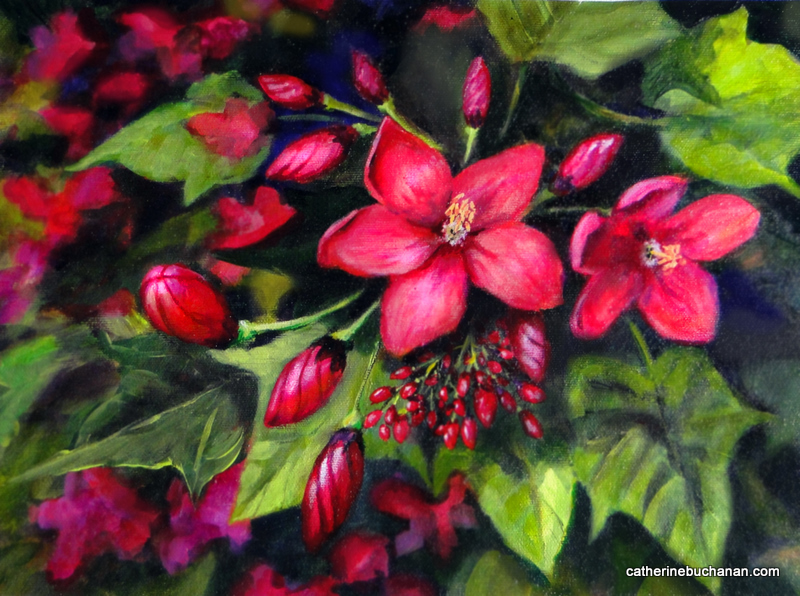 I have a place to work in a former potting shed that looks out on a lovely garden and I'll make an effort to post a painting on my blog every day. I'll work fewer hours and get out on the water in my canoe for that sense of peace when I need it. Anything to prevent putting those pants back on.